Once in a while someone asks a fellow bibliophile (or group of bibliophiles) for a list of novels about books and collecting, and that person is then bombarded with a list. Poet’s Pub, a British novel originally published in 1935, is one that I don’t recall ever coming up in such conversations, so when I read about its recent re-publication by Penguin Classics, I was excited to dive in. The novel evolves into a caper that might well be described as a wittier, less deadly Gosford Park. The new edition features a foreword by librarian and author Nancy Pearl, who felt compelled to revive Eric Linklater’s novel for modern readers. Pearl deserves many thanks for that. For years Poet’s Pub was out of print, even though it was one of the first ten titles used by Allen Lane to successfully launch the Penguin Books line in 1935. Linklater was shelved alongside an eclectic group, including Andre Maurois, Ernest Hemingway, Susan Ertz, Dorothy L. Sayers, Agatha Christie, Beverly Nichols, E.H. Young, Mary Webb, and Compton Mackenzie. Once in a while someone asks a fellow bibliophile (or group of bibliophiles) for a list of novels about books and collecting, and that person is then bombarded with a list. Poet's Pub, a British novel originally published in 1935, is one that I don't recall ever coming up in such conversations, so when I read about its recent re-publication by Penguin Classics, I was excited to dive in. 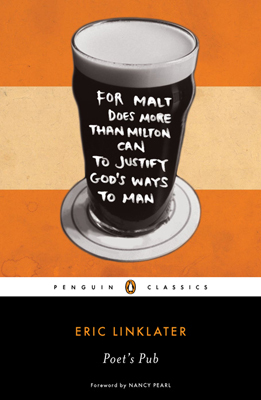 The new edition features a foreword by librarian and author Nancy Pearl, who felt compelled to revive Eric Linklater's novel for modern readers. Pearl deserves many thanks for that. 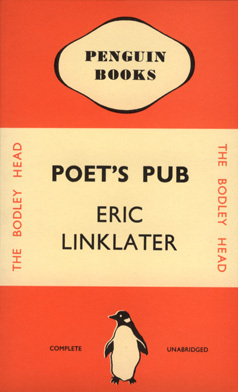 For years Poet's Pub was out of print, even though it was one of the first ten titles used by Allen Lane to successfully launch the Penguin Books line in 1935. Linklater was shelved alongside an eclectic group, including Andre Maurois, Ernest Hemingway, Susan Ertz, Dorothy L. Sayers, Agatha Christie, Beverly Nichols, E.H. Young, Mary Webb, and Compton Mackenzie.